at the Xcel Energy Center in Saint Paul, Minn.
Eddie Van Halen has confirmed that his 15-year-old son with estranged wife Valerie Bertinelli has been named the new bass player for Van Halen, replacing Michael Anthony, who left the band earlier this year. Rumors of David Lee Roth back out front and a possible reunion tour have not been confirmed. I'm still catching up on stuff TGOM! 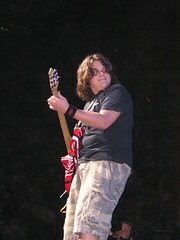 While I love a lot of Van Halen's music (the old stuff) I find it hard to swallow him putting his 15 year old son in the band. I sure hope he plans on protecting his, barely passed puberty, son from all the sleezy stuff that can go on when rock bands are on the road.